Thermoguard Thermostrip PRO is a water based, low odour gel for removing all types of water & oil-based coatings including adhesives like carpet glue. 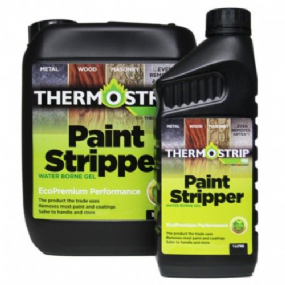 Thermoguard Thermostrip PRO may be used for professional & DIY use. Thermoguard Thermostrip PRO is non-flammable, safer to handle & store while providing a better quality formula for removing all types of water & oil-based coatings including adhesives like carpet glue. This product is suitable for internal or external use & is non-corrosive & non-ozone depleting which is safer for the environment. Whether you are stripping paint, varnish, artex, stains or lacquers, Thermoguard Thermostrip PRO will provide a fast and safe solution to all your stripping requirements. Please note: Temperature affects the speed of stripping - the warmer the better. Ideal working temperature is 25°C while less effective temperatures lie in the 10°C and below range.